Moffat Garden Centre is one of three garden centres owned by the Barr family. 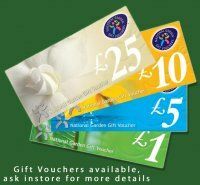 The centres, Heathhall Garden Centre, Dumfries, Whitesyke Garden Centre, Longtown and Moffat Garden Centre are owned and managed by three generations of the Barr Family. We are committed to offering a wide variety of quality plants and garden products and have experienced horticultural staff on hand to answer your gardening questions. For animal lovers, in our pets corner we stock, cages, healthcare products, feeds, treats and accessories for: dogs, cats, rabbits, guinea pigs, hamsters and birds. Tanks and accessories for cold water & tropical fish are also available. Wild bird feeds, feeders and tables are on display all year round. Our extensive range of ornaments, pottery, soft toys, books and photograph frames in our gift department will provide you with inspiration for that special present.